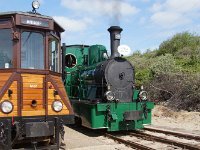 A decent preservation railway needs little encouragement to put up a good show. Such was the case with the RTM (Rijdend Tramweg Museum, Riding Tramway Musem). 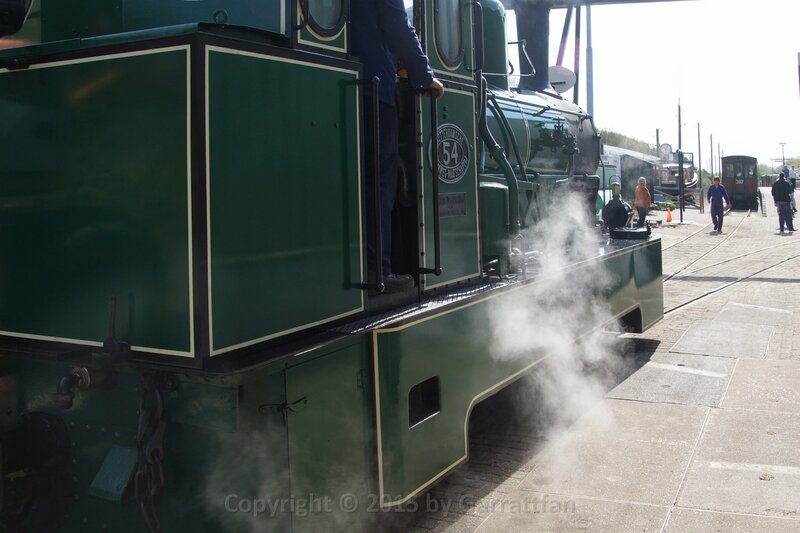 Loco no 54 was a hundred years old in 2015 so the occasion was used to give the National Steam Train Day's (May 14, 2015) steam clouds an extra silver line. 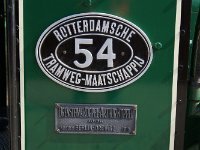 1 The RTM is the heir to the rolling stock of the original RTM, Rotterdamsche Tramweg Maatschappij (Rotterdam Tramway Company), founded in 1878 first operating the city tram network and from 1898 operating a growing overland tramway network until 1966, surviving as a bus company until 1978, only months short of its hundredth anniversary. 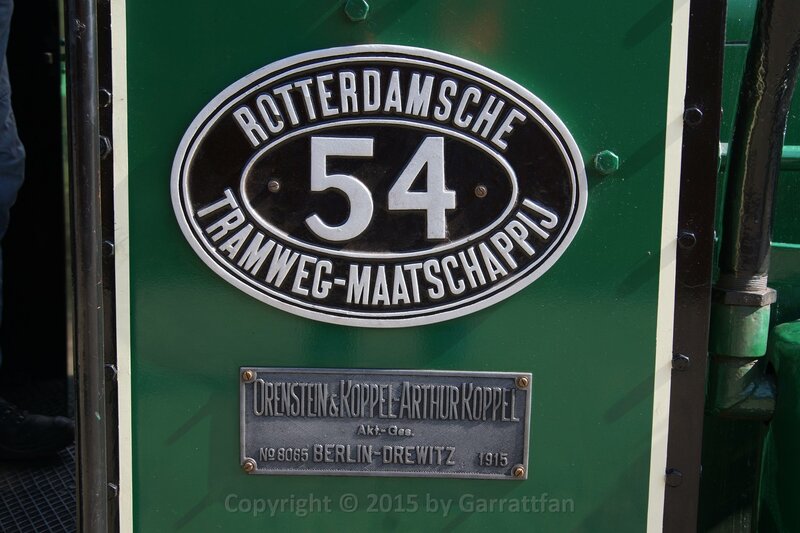 5 No 54 is one of a batch of of four (51-55) built in 1915 by Orenstein & Koppel. This was the fourth batch of 0-6-0 engines, differing in many details from the three previous batches, most important of which is having superheaters. 7 The water hatch is nicely secured to prevent water from gushing out when the loco brakes. 13 1916? 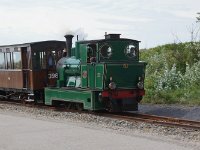 Correct, the loco was built in 1915 and put in service (I.D. = in dienst = in service) the following year. 15 ....leaving the older sister engine behind. Built by Henschel in 1913. 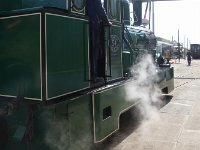 As opposed to no 54 this engine operated on saturated steam. No 50 went out of service in 1957 but was not scrapped. 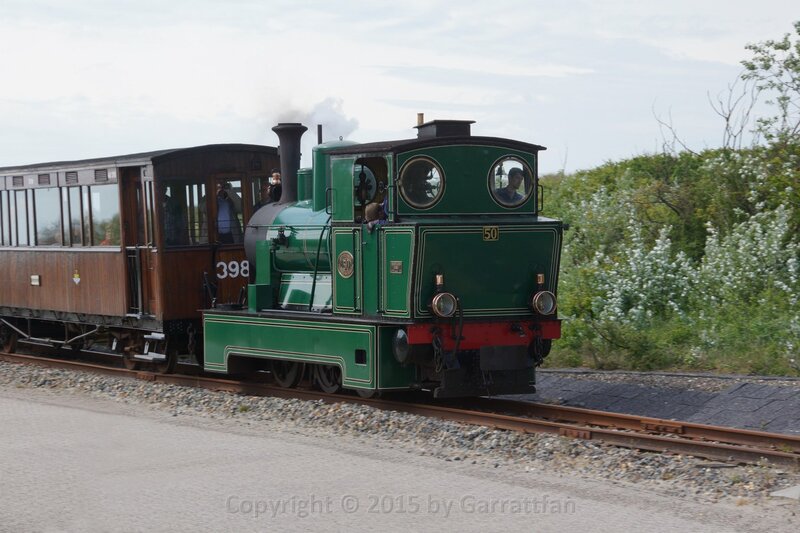 It went into preservation at the then new Tramweg Stichting (Tramway Foundation). 18 Making a good shot of the inside Joy-motion is dificult. The most important feature of the Joy valve gear is that it had no excentrics. This reduced the risk of bearings running hot. 22 Diesel motor car M67 has a complicated history. In the thirties the Maas Buurt Spoorweg Maatschapppij, MBS was looking for more economical forms of motive power than steam. But the economical crisis was raging and tramways were in decay because of road transport competition. With hardly any money to spare they reconstructed some mail/luggage cars into diesel electric luggage motor cars. The (later) M67 had a failure and burnt out. After WWII the MBS ceased to exist and the RTM rebuilt burnt remains of the motor car into it current form. 28 M1805 "Meeuw" (Seagull). Many motor cars had birdnames. This motor car has the same origin as M67. It was rebuilt from a luggage car by the MBS and was given the number M69. Like the M67 is was bought by th RTM. Unfortunately it caught fire in 1951. The Central Workshops of the RTM refurbished the old M69 with a new shell. It returned to service in 1952 in this modern guise. It served the RTM until the abandonment of the tram services in 1966. 31 Two sisters, they could not be more different. 35 This tram consists of three cars in a most peculiar composition: two electrically powered cars, 1701 and 1700, with an unpowered diesel generator car 1700 in the middle. Again it is a homebred reconstruction. The RTM acquired a two car electric tram from Germany in 1959. To provide power for the tram an existing frame was refurbished with a new shell and a generator. It entered service in 1963. After the abandonment of the tram services it was sold to the Zillertalbahn in Austria where it served until 1994. In 1999 it returned to the Netherlands. 36 The unpowered diesel generator car. 38 The "Reiger" (Heron) is also a reconstruction / modernisation from 1950. 39 The RTM earned its keep mainly in freight services over the islands, so there was an extensive stock of freight cars. 40 Work in progress. Most of the upper structure is replaced, though some original panels remain. 42 Cars like these where used to transport passengers from their villages to the next tram station, which were not seldom located far from the towns themselves. 45 No 54 backing up towards the first tram of the day. 50 Redefining the concept of "narrow gauge coach"
55 Who says the Cob in Wales is unique? 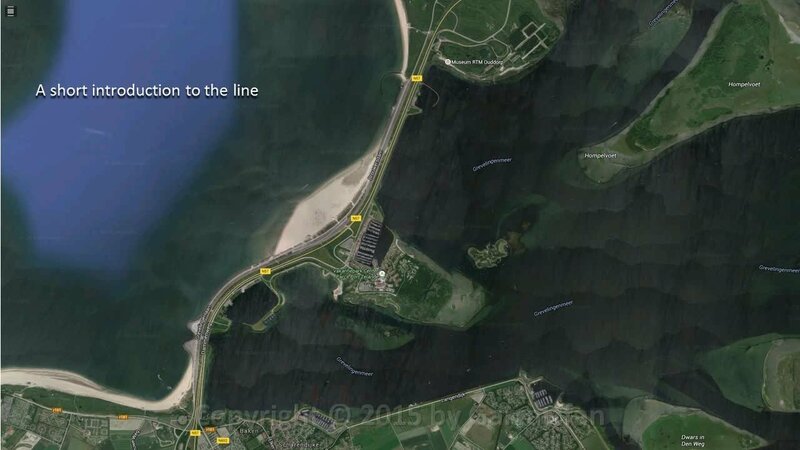 A dam, sea on one side, an estuary on the other, a road on it and a narrow gauge railway. The Cob has a twin! 67 Later in the day I went out to chase some of the other trams. 69 and making a runthrough.Trams stop here for only two reasons: crossing other trams and connecting to the local boat service. 70 The centenarian at the same location. 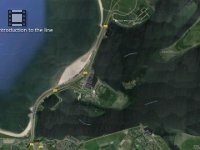 This time there is going to be a halt: both for crossing the returning no 50 and its tram as well as for passengers to change to the connecting boat service. 90 Intricate logo. Despite always lacking money in the last decades the RTM tried to maintain a good level of service and attention to detail. 94 In for a refill. The brownish particles were suspended in the water. 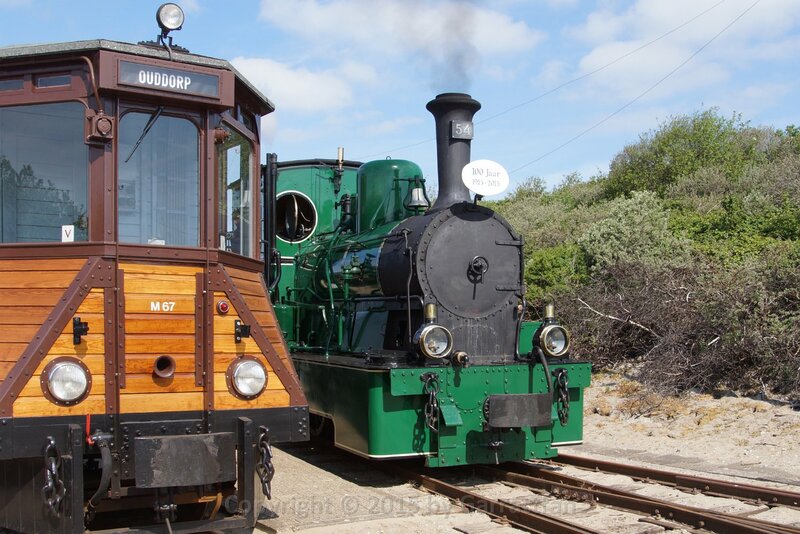 95 A lot of shunting developed to compose the last tram of the day which would be extra lon and would be double headed to celebrate no 54's centenary. 97 Yes. King Willem-Alexander and Queen Maxima were seated here in 2013 they visited the province of Zeeland. 99 They were in good company as his greatgrandmother did the same in 1907.